Mumbai: Large infrastructure companies such as GMR Infrastructure Ltd and Jaiprakash Associates Ltd have been quick to raise several thousands of crore rupees by selling shares to savvy financial investors, known as qualified institutional investors, in the past three months. Now, several mid-size infrastructure companies are looking to raise money through initial public offerings, or IPOs, in the next six to 12 months. At least 10 such companies will raise around ₹ 6,000 crore, according to several investment bankers who spoke on condition of anonymity. Among the companies looking to sell shares are Simhapuri Energy Ltd, a subsidiary of Hyderabad-based Madhucon Projects Ltd; the solar unit of Hindustan Powerprojects Pvt. Ltd (HPPPL), a power generating firm backed by private equity firm Blackstone Group; Agra-based engineering firm PNC Infratech Ltd; Bhopal-based diversified infrastructure firm Dilip Buildcon Ltd; Soma Enterprise Ltd; Power Mech Projects Ltd; and the cold storage chain unit of logistics company Gateway Distriparks Ltd. Some of the information on the share sales is in the public domain: Gateway, for instance, issued a statement last week to the effect; and HPPPL disclosed its plans as far back as May. None of the companies responded to e-mails and phone calls seeking comment. 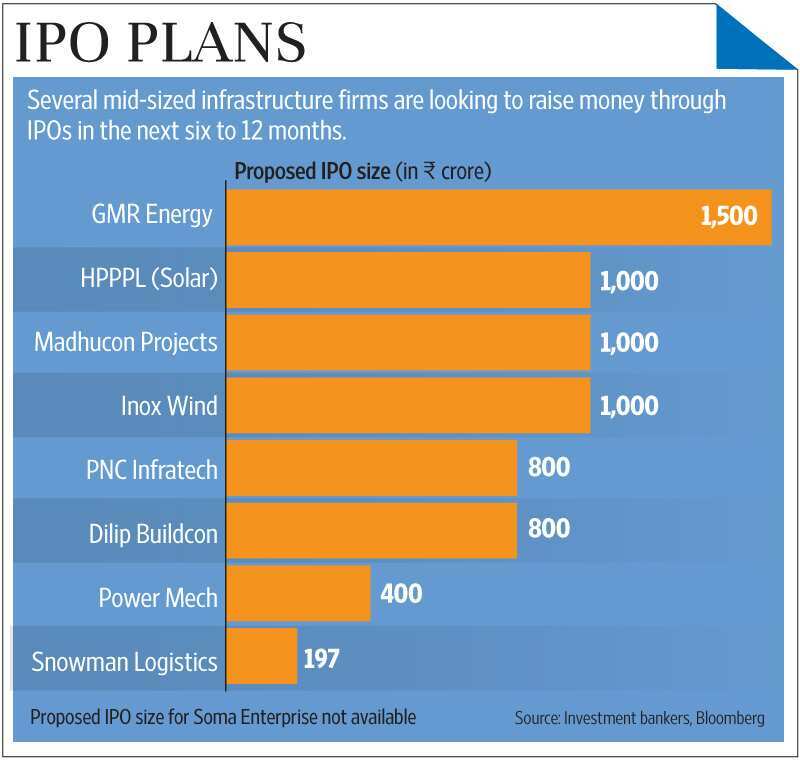 “Most infrastructure firms are looking to tap the capital markets for raising funds. Several of them will be looking to file documents with the Securities and Exchange Board of India in September or in the next three to four months as the fund raising window still remains open," said Subahoo Chordia, head, infrastructure and investment banking, at Edelweiss Financial Services Ltd.
Over the past decade, and especially over the past three to five years, infrastructure companies have seen their books swell with debt that they have been unable to service—largely on account of delays in land acquisition, environmental clearances or securing fuel supplies (in the case of power plants). Many are queuing up to tap the equity markets to raise funds in an attempt to cash in on the euphoria over the victory of the Bharatiya Janata Party, perceived as business-friendly, in the general elections. The perception of the new government (still to complete 100 days in power) as a stable and investor-friendly government has led to improved investor sentiment and liquidity in the equity market. The revival of the qualified institutional placement market is seen by many analysts as a precursor to the revival of the IPO market. IPOs will also provide a much required respite to private equity (PE) firms that have been struggling to exit their investments. Many of the companies planning IPOs already have PE investors. For instance, PE investor Jacob Ballas has a minority stake in PNC Infratech, which it acquired for ₹ 150 crore in 2011; BanyanTree Growth Capital Llc acquired a minority stake in Dilip Buildcon for ₹ 75 crore; and New York-based Blackstone had acquired a significant minority stake in HPPPL, formerly known as Moser Baer Projects, for ₹ 1,398 crore in 2010. Increased deal activity in the infrastructure segment has also led to investment banks hiring more infrastructure specialists. “At least 10 companies are looking to raise about ₹ 6,000 crore through IPOs. There is an increase in deal activity in the sector and therefore we are looking to increase the team strength," Ajay Saraf, executive director at ICICI Securities Ltd, said. Chordia of Edelweiss said the firm had hired several infrastructure experts since May.